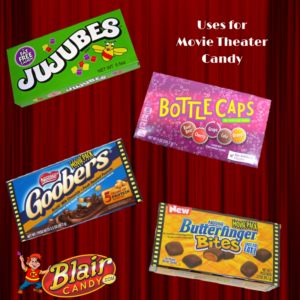 Gifts: Movie theater candy boxes are great for gift baskets or making the base to a candy bouquet. Your recipient will love the sweet, personal touch when you remember their favorite candy. These are also great stocking stuffers. Road Trips: Lessen the clutter and keep messes down to a minimum with a box of candy rather than a plastic bag full. It also may keep your candy from melting from the hot temperatures in the car. If it doesn’t, it should at least keep it from staining your car interior or clothes. Lunches: A fast and easy way to provide a candy treat in your child’s lunch is with a movie theater box. They are perfectly portioned and can fit right in their lunchbox. It can also fit into their backpacks for an afterschool snack that won’t get squished flat. Concession Candy: These are great for concession stands! They’re easy to display, pack up, and move around from game to game. People will also love how convenient it is to take the boxes with them and finish the candy later if they get too into the game. There are plenty of uses for movie theater boxes of candy! Shop all of your favorite movie treats today at BlairCandy.com and find more ways to use these boxes.